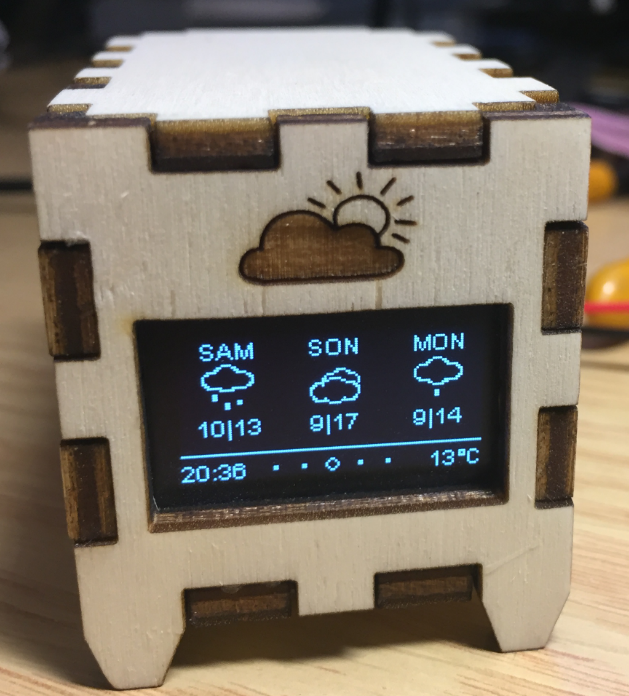 A tweet by Daniel Eichhorn (@squix78) triggered my interest: he created a cool ESP8266 WiFi weather station, and actually sells it as a kit. 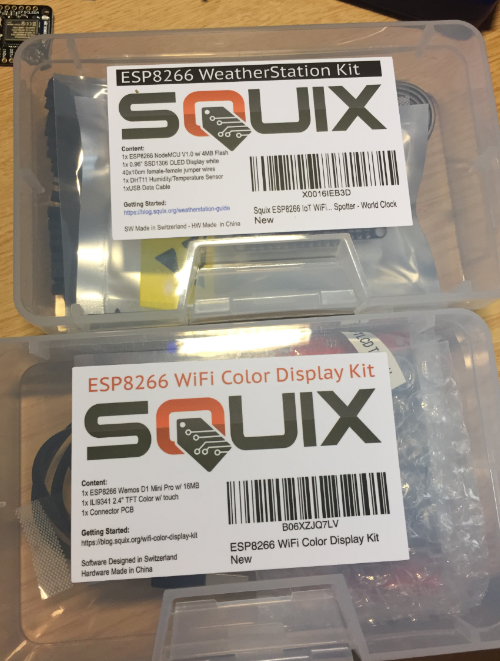 So without waiting I ordered two kits,without really checking all the details: The “ESP8266 WeatherStation Kit” and the “ESP8266 WiFi Color Display Kit“. 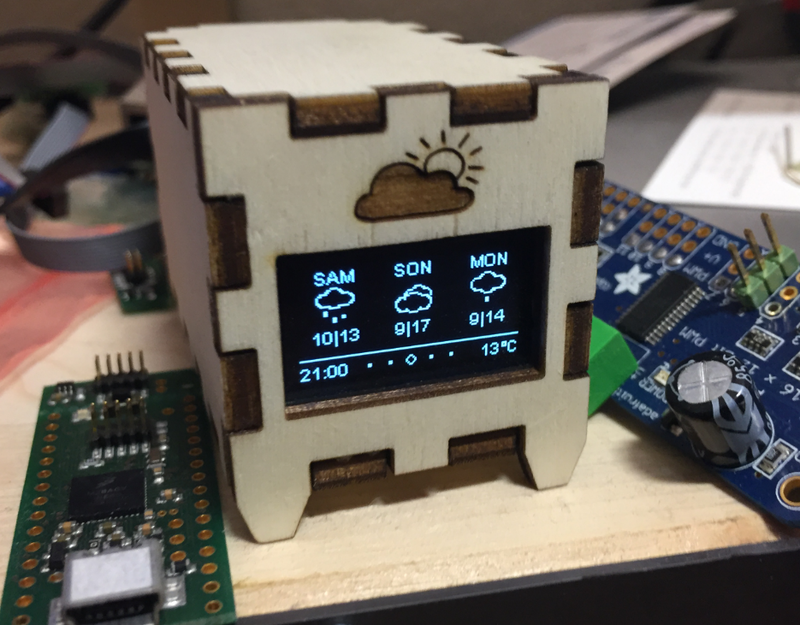 No soldering is required for the ESP8266 WeatherStation Kit. 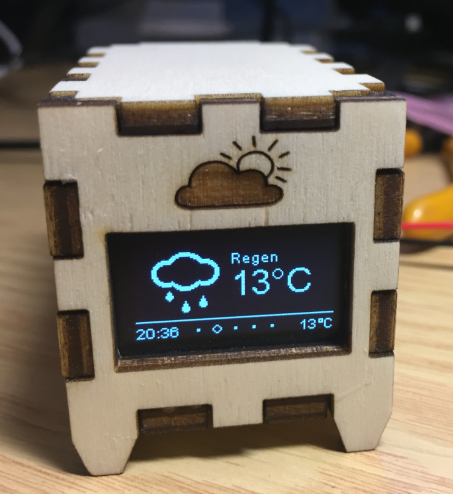 Daniel wrote an excellent tutorial (https://blog.squix.org/wp-content/uploads/2017/06/esp8266weatherstationgettingstartedguide-20170608.pdf) plus a guide how to integrate the DHT11 sensor (https://blog.squix.org/2015/12/esp8266-weather-station-measuring-2.html). With this the wiring and software setup was a piece of cake :-). The example code uses the free Weather Underground (https://www.wunderground.com) weather service. 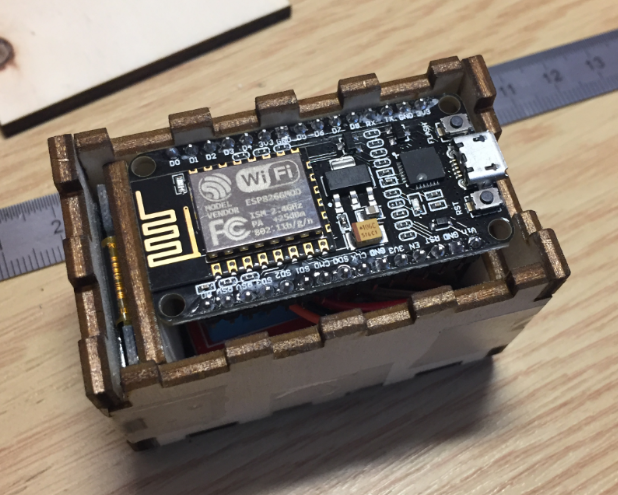 Using the ESP8266 chip it connects over WiFi to the service and receives the data in JSON format. A JSON parser on the ESP8266 extracts the data and displays the data. The weather service provides data for many countries and cities, in different languages. I selected a place a few kilometers away from home. The interval of fetching data is configurable, and I’m using 10 minutes for now. The JSON data has lots of data, and the JSON parser on the ESP8266 extracts information for the display. In the example code it cycles through several pages. Indoor (and outdoor) temperature and humidity. 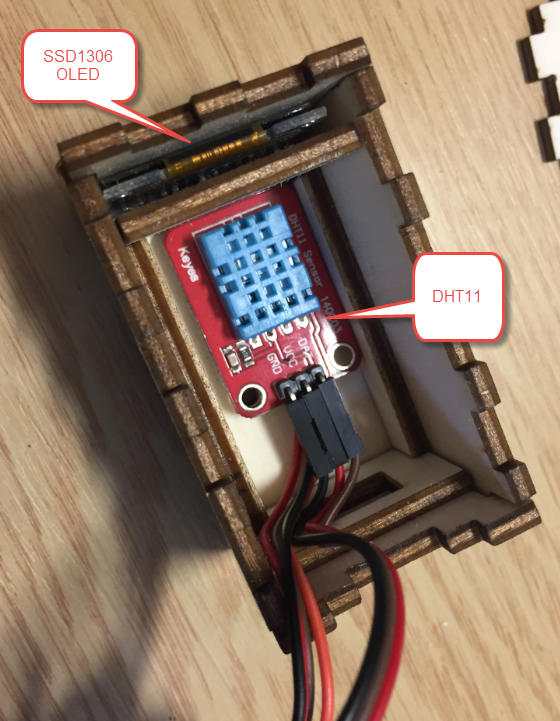 For indoor sensor values it uses the DHT11. The temperature and humidity gets pushed to Thingspeak so I can use it from another weather station (more about this later). I used a 50W laser cutter with the K40 Whisperer software.I needed two iterations (first enclosure was a bit too small). On the backside the USB port with a ‘cloud’ for better air flow. Currently the weather station gets powered through the micro USB connector. Because of the jumper wiring there is no space for a battery. 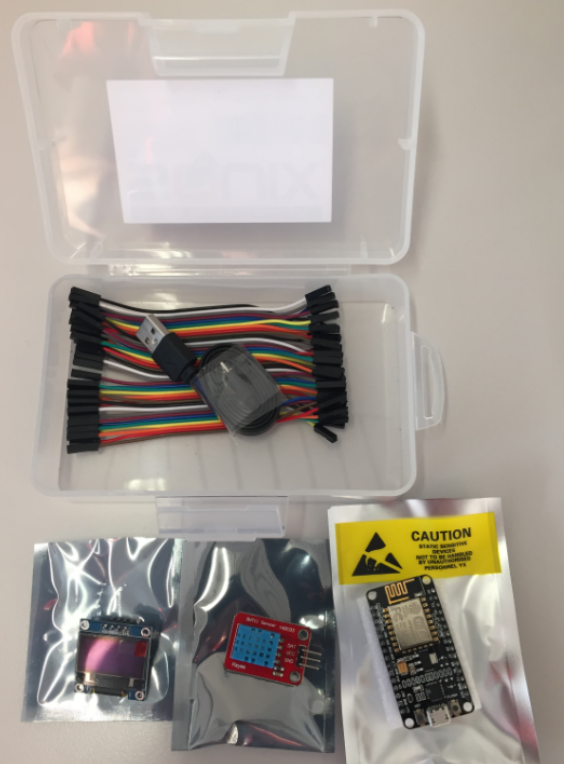 I have ordered a small LiPo plus a charger module for a next iteration. But so far I’m very happy how it fits together and works :-). 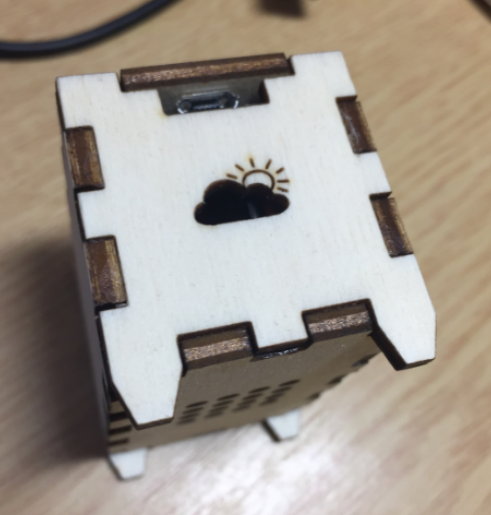 Thanks to Daniel I have now a small and useful weather station. 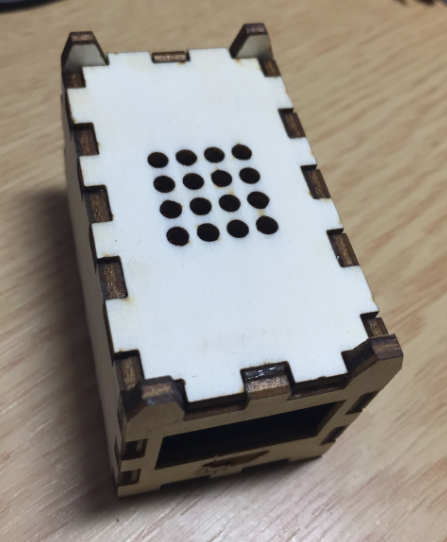 It fetches local weather and forecast data from the internet using the ESP8266 WiFi chip. It pushes data to Thingspeak so I can use it from anywhere in the world. Or display the data another weather station. Remember that I ordered two kits? Yes, that second kit has a touch LCD, so this one will be next :-). 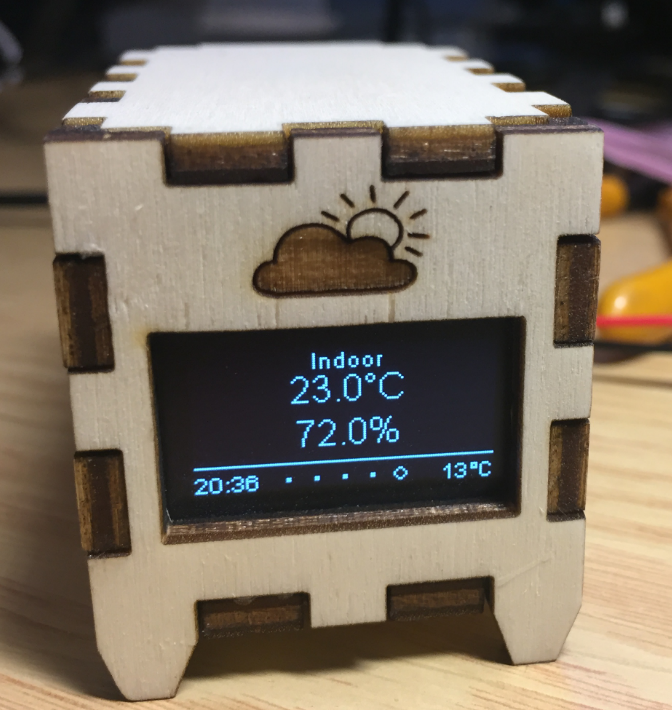 This entry was posted in Boards, Embedded, Laser, Laser Cutter, Tutorial, Wood and tagged DHT11, ESP8266, Humidity, Kits, Laser, Laser Cutter, NodeMCU, OLED, SQUIX, Temperature, ThingSpeak, Weather Data, Weather Station, Weather Underground, WiFi by Erich Styger. Bookmark the permalink. I fear that IoT is real but probably not in our interest. A) What we currently see as Iot is the technology of the end-devices. B) This is useless without its counter part – 5G will enable the connection of massive devices (large areas with high density of devices). I can imagine that there is interest in production industries but guess that the risk of hacking completely open systems will be larger than its gain. So finally only those industries who tend to fetch as much of information from everybody and everywhere and usually abusing this information will drive this game. Security is a big concern, and with all the ‘data collection’ of Google, Amazon, Apple and all the others things easily might get our of control too. And a new class of virus and denial-of-service waves will reach us in the future too :-(. ich möchte das Gehäuse nachdrucken (bzw nachschneiden) lassen. Die svg-Dateien haben laut der Firma keine Maße? Wie kann ich da jetzt da am besten vermitteln, dass die Bauteile in der richtigen Größe geschnitten werden? Du hast oben 35x40x60 mm angegeben, sind das die Aussenmaße? 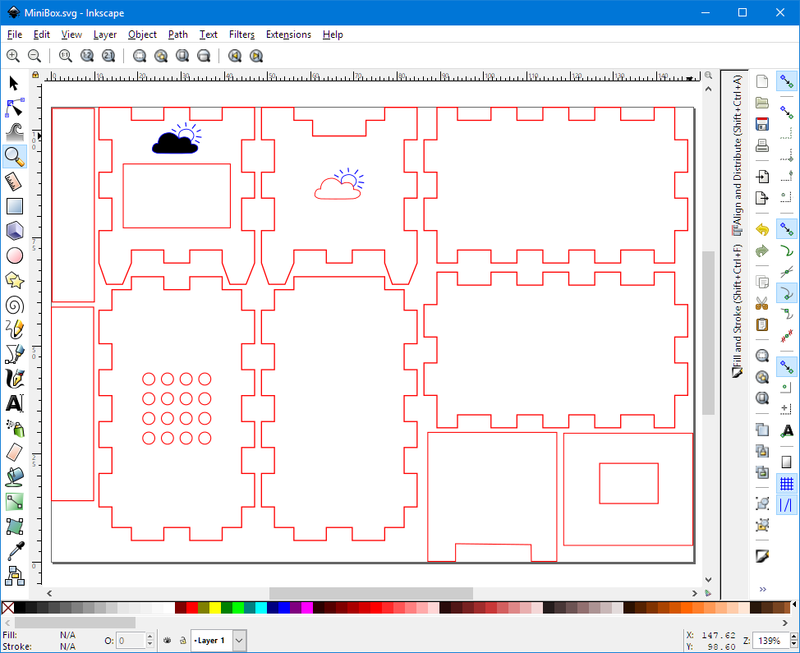 I’m using Inkscape, and there I can specify in the document properties that my units are in mm. And what you see in that screenshots are indeed the number of millimeters, so yes, thes are about the sizes in mm, as shown in the screenshot. the cutting part is done. Thanks for your hint; i downloaded Inkscape and edited your files with success. Now the programming part, it confuses me.. The point ‘wunderground city”, what exactly do i type there? For example, my nearest station is https://www.wunderground.com/weather/de/norden/IWENORDE4. “IWENORDE4” as ‘city’ doesn’t work. “Norden” as ‘city’ takes me to Nordende, that’s a completely different town in germany. “Osteel” works fine, but that’s a few more kilometers away. looks really great! Thanks for sharing!